We spent our Thanksgiving with our local family, spreading the over-eating over two days. I must admit I really liked how that turned out. There are enough strong preferences for what we eat at family gatherings that we tend to fall back on potlucks, so everyone can have what they want. This can result in a over-full table with a variety of dishes that may or may not compliment each other. But when you spread it over two days, then you can have the salmon and the ravioli and the mixed vegetables in one sitting and the turkey and potatoes and cranberries on the following day. I may lobby for this to become a new family habit for Thanksgiving. Not least because of the other benefit of multiple days: more opportunities for a wide variety of pie! "There's Rapunzel's Revenge, and the one in the fairy tale book, and the movie, and the other movie, and the one in the cupboard." Would you believe me if I said I've had this block finished for almost the whole month and I'm just now getting around to posting it? I'm not sure I would believe me either, but there it is. 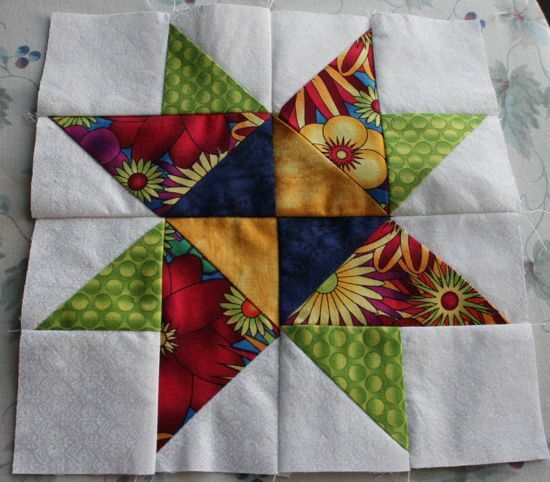 I'm sticking with the same fabrics I started with and plan to continue to do so for the rest of the blocks. Finding something that will work as a sashing or as setting blocks may be a bit of a challenge. Although, maybe I'll find I have enough of this white-on-white that I'm using as the background to use as setting blocks. 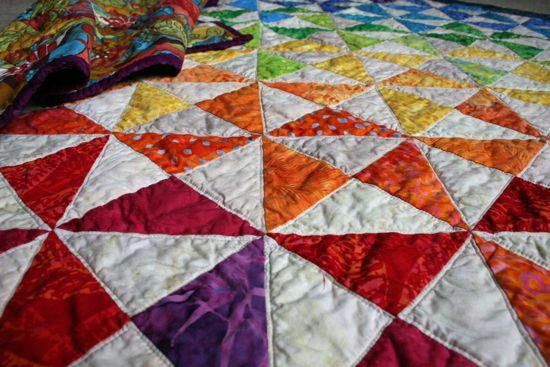 The end result would be unusual for me - I don't think I've ever quilted with white, much less quantities of white. I didn't quite stick with the directions. I'm feeling a bit stingey with the fabric (I've only got just this much of these!) and wanted to avoid throwing out bits. Although, perhaps if I had more strictly done as instructed, my points might be lined up a bit better. But no one is going to notice that, right? The school district sent me an email yesterday (Wednesday) reminding me that there will be no school last Friday. I realize that sentence makes no sense, but neither did their email. But it did remind me that Caitlyn and I spent some project time together last Friday, at her request, with somewhat mixed results. 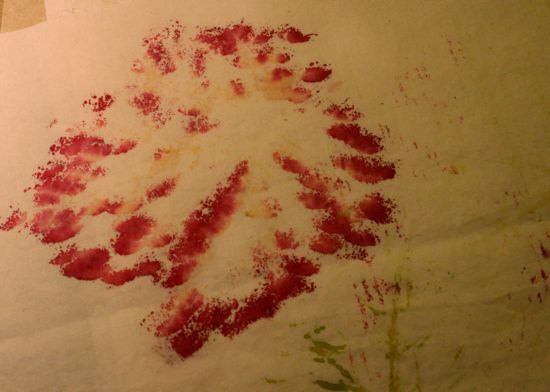 Our first project was a kind of leaf printing. I'd done a search for crafts with fall leaves and found this. Note for next time: it could be significant if there are no photos with the instructions. Without pictures, my imagination provides the expected result, which, this time at least, was disappointing. 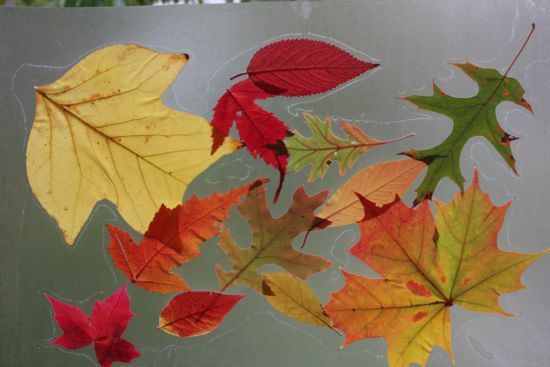 The idea was to collect some of our brilliant fall leaves, lay them on fabric, then pound on them and transfer the color to the fabric. I assumed that the color would transfer in the shape of the leaf, and we'd get a collage of leaf prints. Turns out, only the reddest of leaves have enough color to make a satisfactory transfer, and then only in those spaces you impact with your hammer (or other pounding object). We used a grape leaf in the photo above, which I think maybe you can guess if you squint sideways at it. Perhaps if we used a block to spread out the impact/weight of the hammer, we might have gotten something that looked more completely leaf-like. But, contrary to the instructions' promises, we did not get anything worth framing. 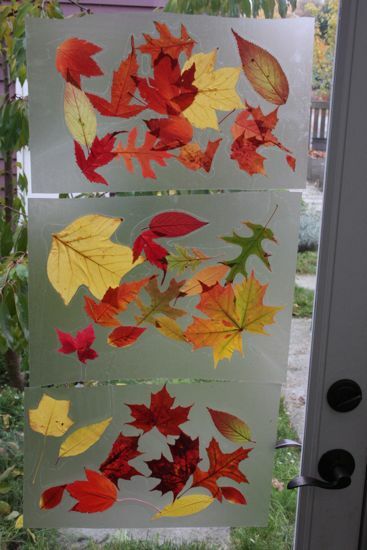 So, we made leaf collages on contact paper instead, and stuck them to the back door. I found the this much more satisfying idea at The Artful Parent. Leaf colors and leaf shapes, held up where the light can highlight them. This is pretty spectacular on the days the sun comes out! And a bonus: the porch light over the door illuminates the top arrangement after dark. Even better, this was a collaborative project, not just me setting things up and getting out of the way or both of us working in parallel. Caitlyn would place a leaf, I'd place a leaf, and we'd talk about using the space and leaf arrangement and which leaves were just slightly fuzzy and prone to falling off the sticky paper. Not a bad way to spend a school-free morning. I'm late, I know. Halloween is so last month. We're less than 10 days from Thanksgiving. Everyone else has already posted their Halloween Costume Posts and moved on. It'd be neat if I had some sort of reasonable excuse, but I don't. And now, it sounds like Caitlyn's Halloween costume was some amazing, intricate thing. She had been asking for a mermaid costume "with a real tail." She was apparently fully aware that this would prevent walking, since requests for such a costume would move on to descriptions of locomoting in roughly the style of an elephant seal. How this was supposed to work for trick or treating, I have no idea. Anyway, I talked her out of the mermaid idea. And told her that two back-to-back fairy princess costumes wasn't an option. Caitlyn vetoed witches, pirates, and storybook characters. 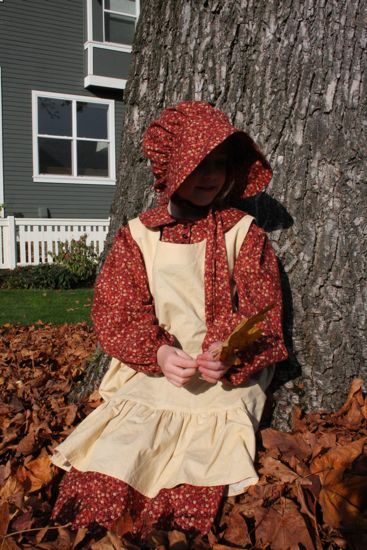 We had a brief flirtation with a potential cat costume (an Everything Cat, which is rainbow colored and winged and probably prone to feats of magic) before settling on a Pioneer Girl outfit. 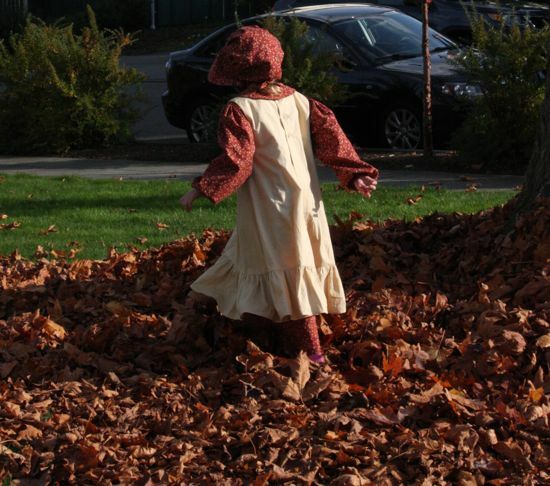 At the time, I thought the bit that convinced her was the possibility that, after Halloween, she could use the dress portion of the costume as a regular part of her wardrobe. Now, I'm wondering how much she was influenced by a friend of hers who scored a Little House outfit from her grandmother. I used McCalls 9424 and Caitlyn helped pick out the fabric. I'm working with her to get past the "more is better" approach to fashion (eg, if 1 color is nice and 2 colors is better, then all the colors at once would be best!) and trying to help her recognize how some colors/fabrics coordinate well and others shouldn't be allowed near each other. Caitlyn approached the fabric selection with the idea that there were three pieces to the costume, so she should pick out three separate fabrics. Maybe I'm old fashioned, but I don't think a brick red dress, a daffodil yellow pinafore and a turquoise bonnet would have worked out as well as she thought it would. 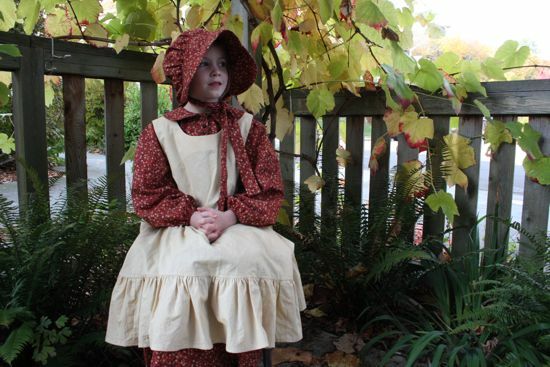 I was still sewing buttons on both the dress and the pinafore the day before Halloween. But it was done in time for trick or treating. We both received lots of compliments. Caitlyn hasn't shown any sign of wanting to wear the dress to school, though. I usually try to have at least some idea of what I'm going to do with a length of fabric before I buy it. It's not like there's a shortage of fabric in my sewing space. 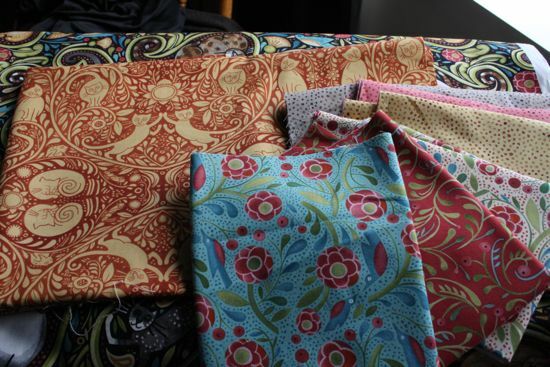 When Pacific Fabrics sent out an announcement that this fabric line, Catkin from In the Beginning Fabrics, had arrived in their stores, I sorta did a happy dance in my chair. 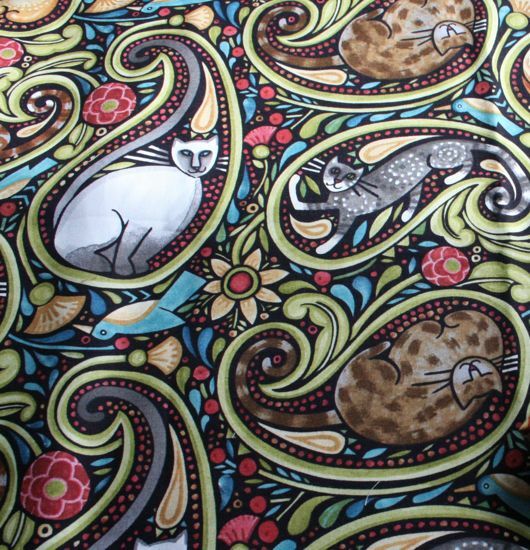 How can you not love cats in paisleys? A week or so ago, when I was popping in for sewing machine needles (not an excuse, really!) I happened to notice something small (a potholder, I think) on display using one of the fabrics from this line and I thought, oh, I'll go check to see if they have the cats-in-paisleys print. It wasn't there last time, and I figured it was probably all gone. With some of this stuff, if you don't get it when it comes out, you miss out - some fabrics get printed only once and that's all, folks. Wouldn't you know it, they had some! I still don't know what I'll do with it. I got enough (I think) to make some 8 inch setting blocks out of the cats to go between blocks made from the coordinate fabrics, but I may do something entirely different. Might just look at those cats any time I need a little happy dance. At the school bus stop this morning, some boys were discussing origins. 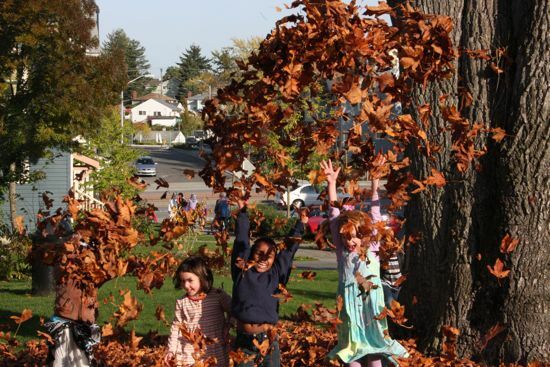 One, a first grader and a child of a recent East African immigrant, pointed out to another boy, also the child of a recent East African immigrant, that they'd both come from Africa. 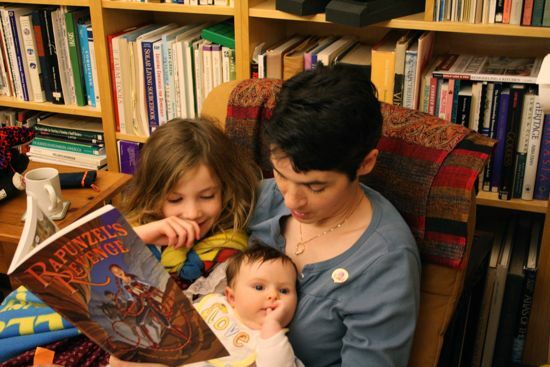 The second boy, H, sort of rolled his eyes, "I know I came from Africa." The first boy, whose name I don't know, so I'll call him M, then turned to a third grader who is African-American and dark skinned and attempted a similar claim, which the third grader, T, denied. Before things got out of hand, T's mom stepped in. "Yes, you all came from Africa, but at different times." I'm not sure what T made of this, but it seemed to baffle M a bit. "I came from Africa not long ago," M said. "I still speak my other language." "That's great!" I told him. "I wish I could speak more than one language." To which H told me he could speak two languages and M announced that his mother speaks seven. "Wow. I only know English and some muddled Spanish. Oh, and I can probably sort of read a menu in German." "You didn't come from Africa," M told me, clearly not ready to move on from sussing out where everyone is from. Well, no. I'm far too pale-skinned to be recently from Africa. But I pointed out that if you go back far enough in time, everyone (probably) came from Africa, it's just that some of us took long detours through cold places to get here. This seemed to confuse M. But before I could explain the time scale I was referring to (and wishing it wasn't so early, so I would have half of chance of being somewhat right in my arbitrary selection of "hundreds of thousands" or "millions"), H came swooping back into the conversation. "You mean," H said, eyes alight, "a long time ago when the animals could talk?" 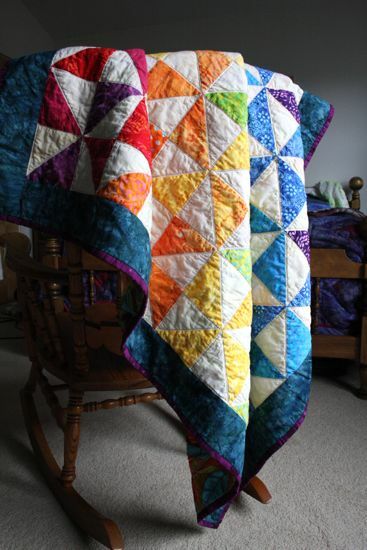 I've actually finished a quilt this year! I have a pile of Works in Progress teetering on the chest in my work space and I keep adding new fabric for additional projects to it (see the sidebar for details). Somehow, the size of the pile doesn't seem to deter me from seeing some new project and rushing out for supplies for that, too. There's probably some deep psychological statement to be extracted here: I'm afraid of running out of things to do? I'm afraid of the risk of starting something? Whatever. It's time to celebrate something being finished. This quilt got started because I wanted to make a quilt for the impending arrival of Caitlyn's cousin and wasn't going to be satisfied just contributing a square to the larger family/community quilt that was in the works. I even knew from the start that I wanted my square in the community quilt to echo the larger quilt. 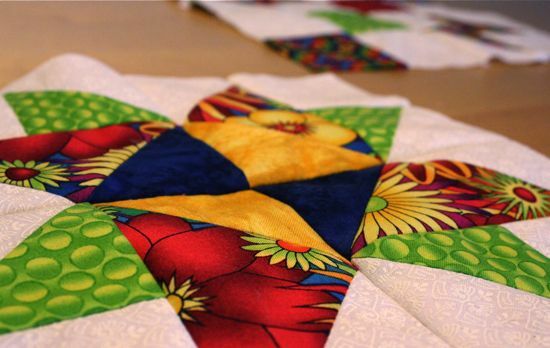 But since I was involved the in the creation of the community quilt, I needed to keep this one fairly straightforward. I completely failed to make a note of the backing fabric. It's crazy colorful and has these awesome bees buzzing about. Ian found it on a family outing to The Quilting Loft (hooray for fabric stores who have a corner with a toy basket! ), after I had nearly settled on a solid teal for the backing. The teal would have worked nicely, but it would have tipped the quilt into "respectable"; the bees keep the whole thing more firmly in the "fun" camp. 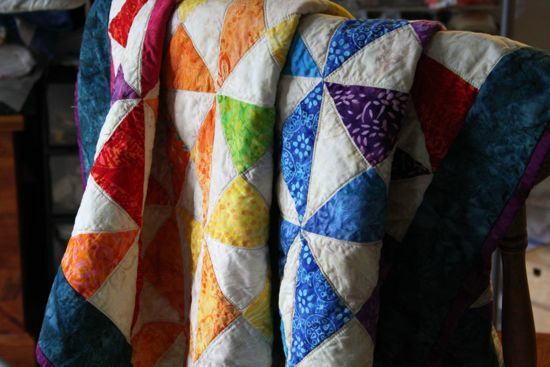 A bit of frosting: having one of The Quilting Loft staff suggest that maybe I'd like to have the quilt hang in their store for a spell. Squeee! Here's hoping it doesn't take me a whole year (again!) 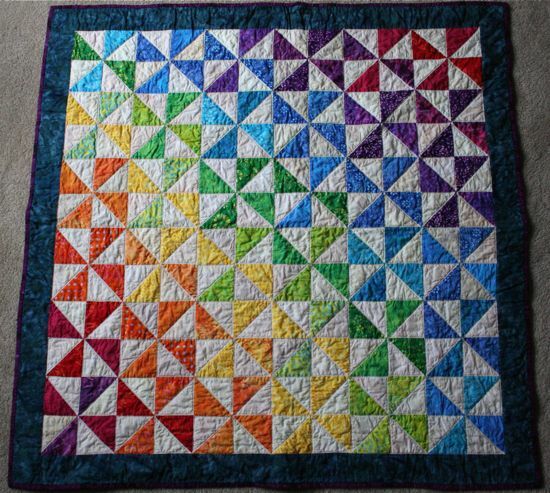 to finish another quilt! The leaf pile was deliberate this year, I'm sure of it. And when the bus let the kids off, several dove right in. 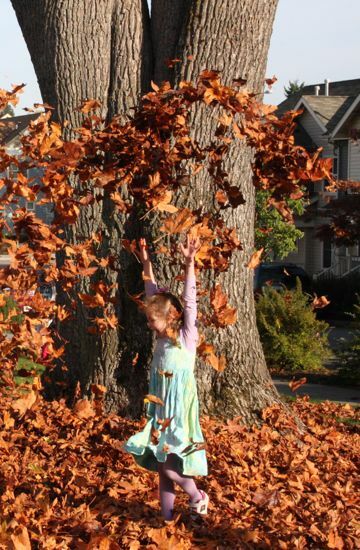 So much joy from one pile of leaves! Which, frankly, isn't much of a pile anymore, now being unevenly redistributed around the park. Fortunately the maintenance crew has blowers and can make short work of re-piling leaves before they haul them away. 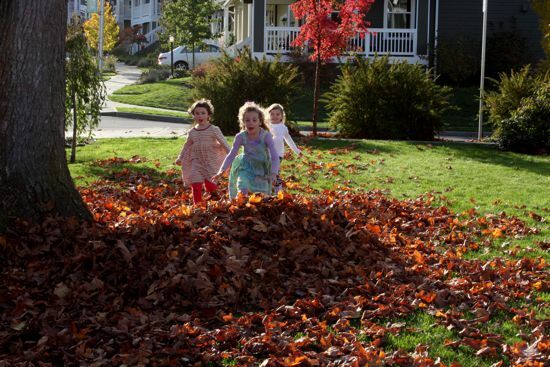 The Annual Big Pile of Leaves in the Park Event means we are well and truly into Autumn. There was frost on the grass and some roofs this morning, and the kids played at being steam trains while waiting for the school bus. The fog burned off to give us a morning full of golden light, gone later as the sky clouded up ahead of a series of weather systems forecast to bring the first snow to the mountains. Time to hunker down. Time for soup and spiced cider, for extra quilts, for a (hopefully) less frantic pace. I've brought in the fifth or sixth basket of grapes last week, wrapping up this year's grape harvest. 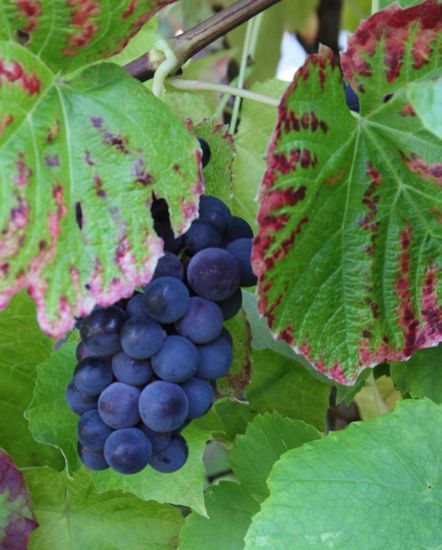 For something I planted for summer shade and fall color, all these actual grapes are an unlooked for bonus. Funny how blue they look when outside on the vine, like I was growing some weird grape leaf/blueberry fruit hybrid. We still have grape jelly from last year's harvest in the pantry, so this year whatever we couldn't just eat fresh either went into the dehydrator to be converted to raisins or cooked down enough to be juiced. I have a bit of a tendency to over-dry the raisins (not sure about the location of that sweet spot of dry enough not to mold but juicy enough to be fun to eat), but they do still go nicely in my morning granola. I've put the grape juice in the freezer because it's really good and I don't want to rush through it. 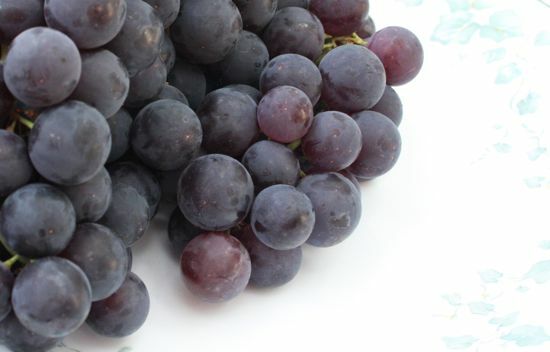 It's tempting to look for things to do with grape juice since there's some effort involved in converting grapes to juice; all that work, surely I can get something more for it than a glass of juice. But I'll probably just thaw it out in small batches and drink it.